Figure 1a. SE editor Basic Settings tab with elastic HA N+M mode selected and two parameters set. Figure 1b. SE editor Advanced tab, Advanced HA & Placement section, with three parameters set. Figure 4a. SE editor Basic Settings tab with elastic HA active-active mode selected and two parameters set. Figure 4b. SE editor Advanced tab, Advanced HA & Placement section, with three parameters set. Figure 8a. 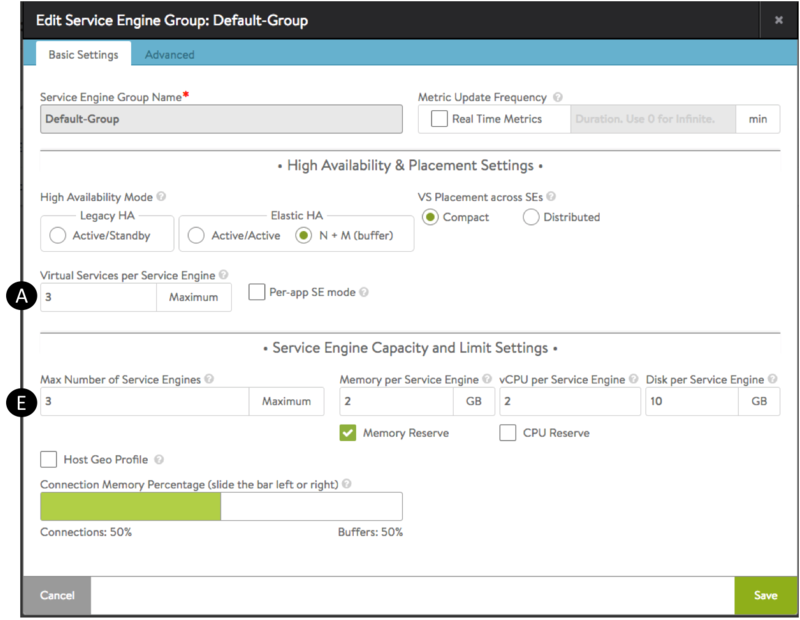 Virtual Service Placement Policy section of SE Group Basic Settings showing default auto-rebalancing settings. Figure 8b. 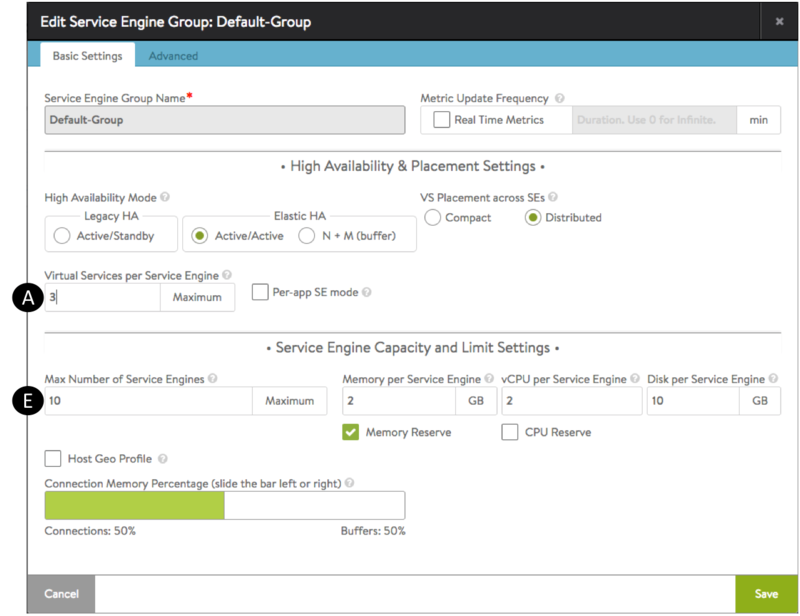 Virtual Service Placement Policy section of SE Group Basic Settings showing default auto-rebalancing settings. When compact placement is ON (label G in figure 8b), Avi Vantage uses the minimum number of SEs required. When distributed placement is ON, Avi Vantage will use as many SEs as required, up to the limit allowed by Max Number of Service Engines (labeled E in the figures). By default, compact placement is ON for elastic HA N+M mode while distributed placement is ON for elastic HA active/active mode. Distributed Placement ON. Subsequent placements of VS3 and VS4 result in scaling the SE group out to its maximum, 4, illustrating Avi Vantage’s preference for performance at the expense of resources. Having reached 4 deployed SEs, the maximum number of SEs for this group, Avi Vantage places virtual services VS5 through VS8 on pre-existing, least-loaded SEs. Elastic HA active/active mode. 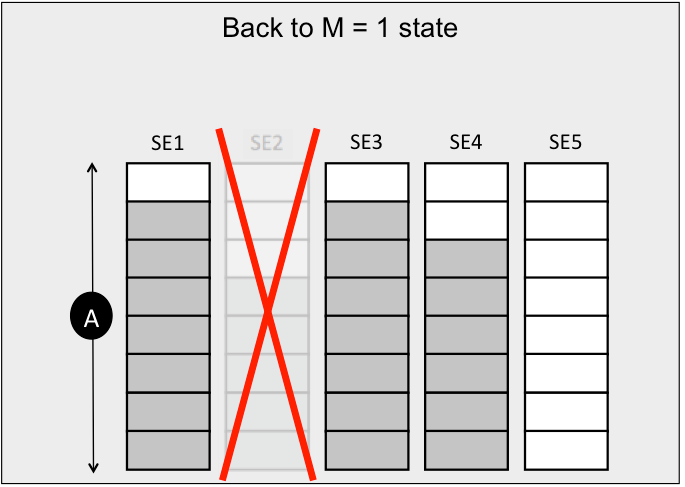 In figure 7, because distributed placement option is ON by default in active/active mode, the Avi Controller delays the placement of VS2 and VS3 until replacement SE7 spin ups. No additional burden is placed on the four surviving SEs (SE1, SE2, SE4, SE5). Instead, both virtual services are placed on a fresh SE, so that all virtual services may perform as they did before the failure. The Auto-Rebalance option (label F in figure 8a) applies only to the elastic HA modes, and is OFF by default . If selected, virtual services will be automatically migrated or scaled out / scaled in when the load on the SEs goes above the maximum threshold or falls below the minimum threshold. Figure 3 shows a use case. As shown in figure 8a, the rebalancing interval may be chosen with a resolution of one second.